This course is for foreign citizens living in Japan who wish to develop Japanese skills necessary for daily life. Just to be able to understand the lively conversation of the elderly and the children in the neighborhood, or the most talked about topics on TV or newspapers will widen the opportunities of joining the daily activities of the community. For those working in Japan, appropriate communication skills will help to promote trust. In this course students will be able to study natural Japanese. Learning Japanese through conversation with others. Learning proper Japanese in a short period. Speaking about yourself in a pleasant atmosphere. Making friends from various countries. Classes may be observed by request (free of charge). Fill out the application form and pay the course fee. Enrollment at TIJ is complete. The Basic 5-day class is a step-by-step class where students study Japanese in 3-levels. You will acquire basic language skills necessary for life in Japan and to communicate in Japanese. Listening to the sound of the Japanese language everyday and exercises in speaking about yourself in Japanese will enable you to use the language effectively in every everyday life, i.e. shopping, asking questions, etc. This course is for students who have completed Level 1 or have equivalent language skills. You will be able to speak in more detail about yourself, your family and your country. Exercises in speaking in different settings will allow you to speak in the polite from. You will also be able to read and write short sentences. This course is for students who have completed Level 2 or have equivalent language skills. You will be able to talk about social issues such as housing, health, and environment. You will also be able to read and listen to short sentences concerning social issues, scientific topics (global warming, technology, etc. ), and current affairs, etc. This class will prepare students to pass the Japanese Language Proficiency Test (JLPT) conducted worldwide. 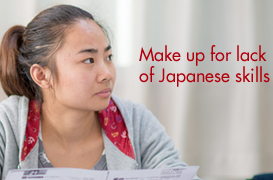 In addition to exercises for the JLPT, students will listen to simple news in Japanese, read newspaper articles, and study conversation skills necessary for presentations and discussions as well as writing essays. Students can also take classes by choosing subjects that students feel necessary on the day of their choice. Students who are capable of daily conversation but feel they lack in-depth communication skills unique to the Japanese language will be able to concentrate on these areas. Grammar：Grammar in preparation for the Japanese Language Proficiency Test . Reading comprehension：Read short texts such as essays, instructions, newspaper columns in preparation for the Japanese Language Proficiency Test in July and December. Listening ：Listen to various topics and brief news clips in Japanese and develop listening skills to pass the Japanese Language Proficiency Test in July and December . Conversation：Discuss various topics and give presentations about a certain issue. Textbook：Develop general language skills by studying Japanese textbooks and also build Kanji skills. 4. 11:45～12:30 Depends on the number of lessons students take in a week.